OKURIBITO's victory in the Best Foreign Film category at this year's Oscars brought attention once again to a film industry whose recent export success had largely been restricted to horror films such as the RING, JU-ON or the ONE MISSED CALL series. Surprisingly, OKURIBITO became the first Japanese film in Academy Awards history to receive such an accolade. Back in the 1950s three Japanese films RASHOMON (Akira Kurosawa, 1952), GATE OF HELL (Teinosuke Kinugasa, 1954) and SAMURAI I: MUSASHI MIYAMOTO (Hiroshi Inagaki, 1955) all received Honorary Foreign Language Film Awards, but the best foreign film category itself was not officially established until 1956. OKURIBITO's achievement cannot be underestimated having beating up international heavy weights such as THE CLASS by Laurent Cantet, winner of the Palme d'Or at the Festival de Cannes 2008 and WALTZ WITH BASHIR by Ari Folman, winner of a Golden Globe Award for Best Foreign Language Film. Nevertheless, Yojiro Takita's film arrived at the ceremony with a pretty impressive résumé, having won 10 awards, including Best Film, at the 32nd Japan Academy Awards, the top prize at the Montreal World Film Festival in September last year and was chosen by Japan's most venerable film publication, Kinema Jumpo, as the best film of 2008. Perhaps more significantly for the Japanese film industry, OKURIBITO was one of a select group of films that have both performed well at the local box office and won awards at home and overseas, especially in a country, where the view of film critics and the preferences of the general public rarely coincide. As if to illustrate this point, only two the "top ten" selected by Kinema Junpo last year even made the list of top twenty box office earners: OKURIBITO (11) and Yoji Yamada's KAABEE (15). Executive Director of Kinema Jumpo Film Institute Yoshio Kakeo explained "Okuribito had successfully managed to find a balance between artistry and entertainment"(2). Initially released in Japan in September 2008, it ended up occupying 11th spot on the list of highest grossing films of that year. However, spurred by its victory at the Oscars it was re-released at the end of February and quickly moved to the top position at the local box office for the first time; another extremely rare achievement. OKURIBITO's formula, mixing drama with quirky "foreign" black comedy encompassing deep-rooted cultural issues has been proved a winning formula at the Oscars. As pointed out by Yoshio Kakeo "Many recent Japanese movies explore [our culture's] deep, subtle feelings, which are often difficult for non-Japanese to understand. Japanese virtues such as 'a-un' [an instinctual understanding] or 'iwazu mogana' [needless to say] are very hard to convey. Okuribito succeeded in presenting such Japanese sensibilities in an easy-to-understand way"(3). Certainly, OKURIBITO presents a story of uninhibited feelings and emotions through the exploration of the mourning process of family members, falling sometimes into areas of unrestrained sentimentality. Moreover, the film also explores the secretive world of the Japanese undertaker, which is as alien and unknown to the Japanese themselves as to the foreign audience. The art and traditions of the undertaker's role as shown in the film, are brought to the screen in extremely detailed, almost documentary-like ritualistic scenes making it fascinating didactic viewing for the local public. OKURIBITO's acclaim from both critics and public alike mirrors that the film by the undisputed king of Japanese cinema, Hayao Miyazaki. His film SPIRITED AWAY, was a previous winner of an Oscar for best animation, the Golden Bear at the Berlin Film Festival in 2002 and most importantly, considering that box office records around the world are usually dominated by Hollywood blockbusters, is currently the highest grossing film in Japan cinema history. To refer him as the king is barely an exaggeration given that his Ghibli Studio have managed to place four of their works in the top 10 highest grossing films of all time. Thus, OKURIBITO's extraordinary performance leads us to the question of how healthy the current state of Japanese cinema is. At first glance things look reassuringly optimistic. Japanese films have won important awards abroad (Naomi Kawase's THE MOURNING FOREST, Cannes Grand Prix 2007, Izuru Kumasaka's ASYL-PARK AND LOVE HOTEL, Best First Feature Film at Berlin International Film Festival 2008, Kunio Kato's LA MAISON EN PETITS CUBES, Oscar for Best Animated Short 2008) and have generated impressive annual box office returns in recent years thanks almost exclusively to Hayao Miyazaki's works (PONYO ON THE CLIFF BY THE SEA in 2008, HOWL'S MOVING CASTLE in 2005, ODORU DAISOSASEN 2 in 2003, and SPIRITED AWAY in 2001). The country's film industry is still able to churn out more than 400 films a year, which makes it the third largest producer of movies in the world behind India and the USA. The box office earnings of local productions last year accounted for 59.5% of the whole share; however, not everyone benefits to same degree in the industry's economic success. 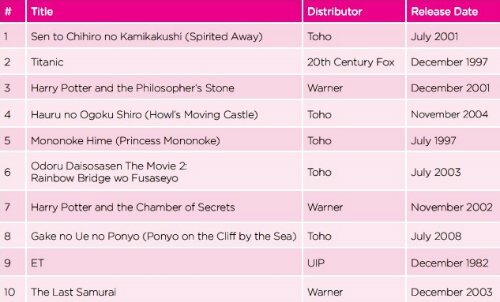 Last year's top 10 Japanese films at the box office accounted for about 60% of total domestic theatrical release sales. Furthermore, the 28 titles that earned 1 billion yen or more accounted for nearly three-quarters, leaving the other quarter to be shared by 390 others. Likewise, many have criticised the influential role of TV companies in financing and producing films and the industry's unremitting reliance on adaptations of manga, anime, TV dramas and novels. OKURIBITO, as an example, is based on the best-seller Nokanfu Nikki (English's title, Coffinman: The Journal of a Buddhist Mortician) by Shinmon Aoki. Critics have been outspoken about the lack of original screenplays coming through, and point to this as a reason for lack of originality and the low production quality of much of Japan's annual output.